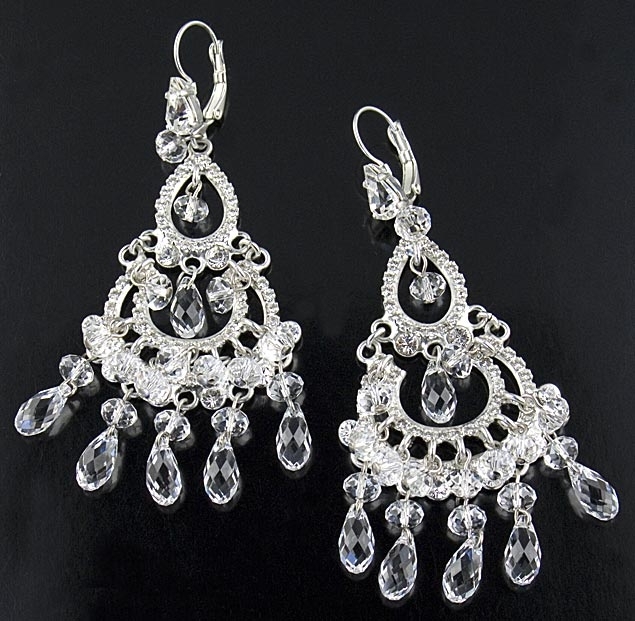 Silver chandelier earrings with Swarovski crystals by Otazu. These striking designer earrings feature a lace-like design covered with swarovski crystals surrounded by ten 5mm Swarovski roundelles. Six 10mm Swarovski briolettes also dangle at the end. Earrings measure 9cm / 3.5 " in total length including the stones. A timeless pair of designer earring that will add sparkle to your outfit. Also makes a wonderful gift idea for a loved one and a perfect pair of earrings for the bride to be. Length: 9cm / 3.5 "